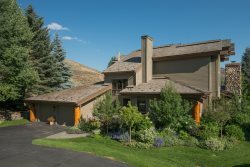 Located 100 yds off the Big Wood River, Walking Distance to Downtown Ketchum, and 1.5 miles from River Run Ski Lifts, this peaceful 4 BR / 4.5 Bath End Unit Luxury 3,400 SF Townhome is highly desirable year round provides direct access to the Big Wood River- a Fly Fisherman's dream! Hike/Bike/XC-Ski/Snow Shoe on the Wood River Trail System (outside the front of the property) or take the Free Shuttle or Drive to the Ski Lifts- only 1.5 miles from the home. LIVING AREA: Open and inviting, the spacious living area features Cathedral Ceilings, exposed Wood Beams and soft light from the surrounding windows. Cozy up in front of the River Rock Wood Burning Fireplace and see if you can catch an occasional sightings of Deer or Elk in the back yard or gather the gang around to watch the game on the Flat Screen TV. GOURMET KITCHEN: The gourmet kitchen is very spacious and easily accommodates a cook and several "helpers". Fully equipped, the kitchen features Double Ovens, a Gas Cooktop, Wine Cooler, Island with Sink, and Granite Counters galore. Lastly, enjoy the Granite Counter Seating for 6- perfect for entertaining or casual meals. DINING AREA: For more formal meals, the adjacent dining area seats 8 - 10 and overlooks the Patio and River-Fed Channel through the large windows. FURNISHED PATIO: For alfresco meals, head outside to the furnished patio and throw on your favorite steak on the Gas Grill and enjoy those long summer days. Additionally, there is a POWDER ROOM, LAUNDRY ROOM, access to the Heated 2-Car Garage and Free WiFi. This home is dog-friendly upon owner approval only. Pet Fee/Deposit varies.